ll members, non-members, and even visitors who call St. Peter’s their “church home” are invited to be a part of whatever is possible to enhance the mission and ministries of St. Peter’s. Why? Because many things and situations of this world can benefit from the justice, healing, and reconciliation of the Church, through communities like St. Peter’s. Now is a perfect season to engage our Parish Vision through action. The movement from vision to action is an ongoing process rooted in prayer and only possible with God’s help. The Clergy, Vestry, Staff, and dedicated Lay Leaders are committed to empowering the parish community, and sharing in whatever is necessary to make St. Peter’s an even more faithful mission station of God’s Church in and beyond the Charlotte region. Our purposeful call to action is foundational to the faith we share, beginning with what we receive from God’s Table at services of Holy Communion before being dismissed into the world at the end of the liturgy. St. Peter’s Parish Vision is to become a community of bold followers of Jesus, a crowd that effects good change for the world, a place known for radical love and welcome, and a beacon of hope in Center City Charlotte. Imagine the difference that would come to our lives, the lives of others, and the world, if each parishioner were to act on this vision in one way or another. 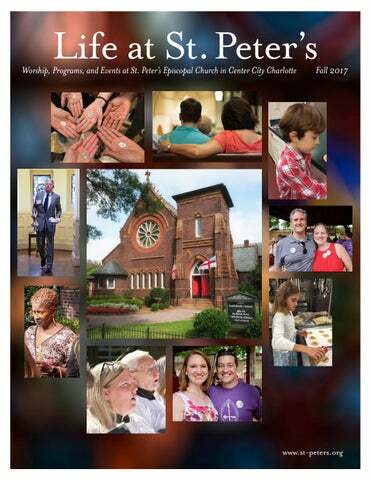 In addition to offerings listed in this issue of Life at St. Peter’s, stay tuned to parish news and notices posted online and in the Parish House lobby. Small and large group gatherings, special events, and community initiatives which support ways for actions to speak louder than words. Membership Whether you are a visitor, a newcomer, or a longtime member, St. Peter’s strives to be a place of radical welcome. We want you to feel welcome and encourage you to extend welcome to others, so that they too will know how much they matter as a beloved child of God. Newcomers bless us regularly, and we find joy in weaving them into parish life. Occasional newcomer coffees and “Discover St. Peter’s” gatherings assist people with getting to know one another, and learning about our mission, ministries, and vision. Each autumn, we hold an inquirers/confirmation class called “Becoming Episcopalian” to provide additional resources for walking the Episcopal path of Christianity. On the St. Peter’s website (www.st-peters.org), click on Start Here, then Visit St. Peter’s, where you’ll find more information under About Membership as well as What We Believe and What to Expect. We encourage those who worship with us regularly to explore becoming baptized and/or confirmed members to participate fully in the spiritual life at St. Peter’s. Confirmation is required to serve in certain roles in the parish and the Episcopal Diocese of North Carolina. Interested in learning more about membership, baptism, or confirmation? Contact our Associate Rector, the Reverend Jacob E. Pierce (jpierce@st-peters.org, 704-749-6150). How to Get Involved Want to know more about getting involved at St. Peter’s? One way is to visit www.st-peters.org and click Start Here, About, and Ministry Areas. Another is through meeting with a member of the Staff, Clergy, or a ministry area leader. We believe that deeper engagement fosters deeper connection and belonging in a way that can make St. Peter’s the center of one’s faith journey. Contact Ministry Associate, Elaine Wood (ewood@st-peters.org, 704-749-6141). orship calls us to set aside our everyday lives to come together as God’s people to pray, to read and hear the Holy Scriptures, to experience music, to be silent, and to share in the holy meal from God’s Table. In all these ways, worship affirms our relationship with our Creator, broadens our relationships with fellow worshippers, and carries us beyond ourselves into the world in which we live and move and have our being. Part of our Parish Vision is to be “a crowd that effects good change for the world.” This we know is a massive but possible challenge. Worship prepares us for that challenge by strengthening us to be a source of good change for the world as it nourishes and restores us. Central to worship at St. Peter’s is the service of Holy Communion (Holy Eucharist, The Supper of the Lord). By participating in this sacred feast, we receive the risen Christ into our bodies and bear his love and goodness into the world beyond St. Peter’s doors. Here at St. Peter’s, worship takes many forms: Holy Communion on Sunday mornings, 8:00 am and 10:45 am; Choral Evensong and Taizé-patterned services on Sunday evenings, 5:00 pm; Morning Prayer on weekdays in the Chapel, 8:00 am; Holy Communion on Tuesdays in the Chapel, noon; Private prayer and meditation in the church, weekdays 8:00 am – 4:00 pm. All are invited to experience worship in many forms at St. Peter’s as we celebrate what God has done and is doing to renew the world, to strengthen us, to effect good change for the world. unday morning is only one time among many to worship at St. Peter’s. In response to individual and household schedules, our worship life includes Sunday evenings and some feast (holy) days. Sunday Evenings at St. Peter’s provides alternative opportunities to feed the souls of those who may be seeking a different experience from our morning liturgies. From September through May at 5:00 pm, St. Peter’s offers a service of Choral Evensong with Holy Eucharist on most second and fourth Sundays. Throughout the year, the third Sunday of each month features a service of Holy Eucharist patterned after a contemplative religious community in Taizé, France. The contemplative services of Sunday Evenings at St. Peter’s offer distinctive ways to meditate on the Holy Scriptures, intentional periods of silence, stirring musical offerings, and candlelight. At the non-Evensong liturgies, music for piano is a popular addition to the experience. Sunday Evenings at St. Peter’s can be a perfect way to enter the week and keep the Sabbath holy. We hope that you will add evenings to your journey and invite others to join you. Baptism is a sacrament of initiation by water and the Holy Spirit into Christ’s Body, the Church. Liturgy is derived from the Greek words for “people” and “work.” So when we speak of the liturgy related to our services, we are indicating that public prayer and worship are the work of the people. Sacraments are outward and visible signs of inward and spiritual grace, given by Christ as a means for receiving God’s grace. In the Episcopal Church, Baptism and Eucharist are the two essential sacraments. Worship with Us Sundays 8:00 am Holy Eucharist (Communion Service) in the traditional language of The Book of Common Prayer includes sermon, organ music, and hymns. 8:30–9:25 am “Holy Chow” Breakfast in the Community Room until 9:25 am (September–May, whenever Christian Formation classes are offered). 9:30–10:30 am Christian Formation (Education) for all ages in the Parish House, with additional offerings during the summer. 10:45 am Holy Eucharist (Communion Service) in the contemporary language of The Book of Common Prayer includes sermon, choral and organ music, and hymns. Coffee Hour follows the 10:45 am service. 5:00 pm Choral Evensong with Holy Eucharist (most second and fourth Sundays between September and May); Taizé-patterned Holy Eucharist (every third Sunday); and extra Sunday evenings as announced. Monday through Friday 8:00 am Morning Prayer in the Chapel, a meditative, 30-minute service from The Book of Common Prayer for entering the day ahead. Tuesdays Noon Holy Communion in the Chapel, a 30-minute service designed to re-center the spirit at lunchtime. hristian formation (education) for adults, not unlike children and youth, is about growing in our faithfulness and discovering how faith is relevant to all aspects of our lives. At St. Peter’s, we offer a variety of learning choices on the “Calendar of Worship, Programs, and Events”— from simplifying one’s life, to closer studies of the Holy Scriptures, to conversations about reconciliation, to offerings that might inform ways to serve others. St. Peter’s creates opportunities to deepen one’s faith on Sundays, weekdays, and even online at www.st-peters.org. Explore your faith by expanding your learning options with other adults at St. Peter’s. While individual formation can occur 365 days a year, most of our programs are scheduled September–May, with special summertime offerings between June and August. Classes and forums are held in various locations, including the Parish Hall, Community Room, Second Floor Conference Room, Parlor, Tower Room, and Town Choir Room. Specific locations are posted in the weekly eNews, worship service leaflet, online calendar, and on bulletin boards. November 26 “Conversation with the Clergy - People Look East: Preparing for Advent and Christmas,” hosted by the Clergy. December 3 “Advent: A Time to Stop, Look, and Listen – Fostering Individual Prayer Practices,” presentation by parishioner Terry Prince and the Clergy. December 10 “Annual Meeting of the Parish,” facilitated by the Rector, Wardens, and Vestry. December 17 “Praying Through the 12 Days of Christmas,” reflection and conversation with Parish Lay Leaders and the Clergy. December 24 All Christian Formation classes are suspended until January 7. January 7 “New Year Reflections on Who We Are: Baptismal Identity and Mission,” conversation led by the Clergy. “Becoming Episcopalian” Inquirers/Confirmation Class, August 20–October 8, 9:30–10:30 am. In preparation for the Visitation of our Bishop Diocesan, the Right Reverend Samuel Sewall Rodman III, on Sunday, October 15, an 8-week “Becoming Episcopalian” class will be led by a team of Clergy and Lay Leaders. Adults who wish to learn more about, have a refresher, or reaffirm their faith as Episcopalians; those who are not confirmed Episcopalians; or those who wish to be received into the Episcopal Church from another Christian tradition should consider this class series. Bishop Rodman will administer confirmations, receptions, and reaffirmations. For more information, contact Ministry Associate, Elaine Wood (ewood@st-peters.org, 704-749-6141). Fall Book Study “The Woman Next Door.” On Sundays, September 24, October 1, and October 8, 9:30-10:30 am, parishioner Rob Smith will facilitate a study of The Woman Next Door by Yewande Omotoso. Excerpt: For decades, two strong-willed women were committed enemies. One is black, one is white, both are widows, and they are next door neighbors in an affluent section of Cape Town, South Africa. To sign up, visit www. st-peters.org/signup. For Newcomers. On Sunday, November 12, join the Clergy and Congregational Development Team for a Newcomers’ Coffee in the Parlor from 9:30–10:30 am “Discover St. Peter’s,” a twoweek overview of the Episcopal faith and ministries of St. Peter’s Parish, will be offered on Sundays, January 21 and 28 from 9:3010:30 am. Watch for additional newcomer offerings throughout the year. God’s Tapestry Potluck and Conversation On Sunday, October 22, 6:00 pm, the Sabbatical Congregational Program Committee will host a formation and fellowship event for all to become better acquainted through storytelling over an eclectic spread of food. Childcare will be provided. Consider attending 5:00 pm Choral Evensong before attending the Potluck. Watch parish news and notices for more information. t. Peter’s youth in grades 6–12 participate in the transformative Journey to Adulthood (J2A) program, in addition to worshipping from the pews and serving as acolytes (altar servers), lectors (readers), and Eucharistic ministers. J2A focuses on celebrating the transition into adulthood, learning skills for living in the world as faithful followers of Christ, exploring the mystery of our faith heritage, experiencing the strength of community, and engaging outreach to our community and beyond. Central to J2A is the gathering of younger and older teens on Sunday mornings with trained and dedicated adult leaders from the parish, as well as for overnight experiences, such as retreats, mission trips and Diocesan events. The program also features, in the summer before Confirmation (during a young person’s junior or senior year in high school), a special Pilgrimage, usually to a site of spiritual importance decided upon by the class. J2A classes and activities are usually held on the lower level of the Parish House. October 21, Trip to SCarowinds. Carowinds is transformed from a “theme park” to a “scream park” at SCarowinds, making for a fun annual event for parish youth and friends. November 26, December 3 and 10, Advent Fair Fundraiser. Items are available for purchase, some of which are made by our youth and their parents, to raise funds for the next J2A pilgrimage. For more information about youth formation, including enrollment for your child, and to sign up for events or volunteer opportunities, contact Director of Youth Formation, Lyn Holt (lholt@st-peters.org, 704-749-6148). Watch the weekly eNews, worship service bulletins, website, and Parish House bulletin boards for more about offerings for youth. ne of our primary beliefs is that children have a unique relationship with God, and that the growth of this relationship should be assisted by a caring, trained adult catechist (teacher) and directed by the Spirit of God within the child. We do this through Catechesis of the Good Shepherd, a Montessori-based program where children ages 3–12 come into contact with Scripture and the liturgy of the church. In specially-prepared rooms called atria, trained catechists create an environment where work and study spontaneously become meditation, contemplation, and prayer. A toddler atrium located adjacent to the nursery serves children ages 2–3. Parents Connect Beginning in the Fall of 2017, a new fellowship opportunity for parents of children and youth will gather occasionally to foster community and offer encouragement. Sundays, 9:30–10:30 am, in the “St. Peter’s Café,” located on the entrance floor of the Parish House. For more information, contact the Reverend Jacob E. Pierce (jpierce@st-peters.org, 704-749-6150). Infant and Toddler Care Care for infants and toddlers up to age two is available 7:30 am– 12:30 pm in the Infant and Toddler Center, near the entrance to the Chapel and next to the transitional Toddler Atrium. Childcare also is made available for most special classes and events. erving the community is a long-standing tradition of the people of St. Peter’s, one that grows and changes in response to needs. We take seriously Christ’s words, “just as you did it to one of the least of these who are members of my family, you did it to me.” As part of our Baptismal Covenant, we seek and serve Christ in all persons, striving for justice as part of honoring the dignity of all people. This is one way we seek to achieve our vision of being a beacon of hope in Center City Charlotte and beyond. Outreach is reaching beyond our internal parish life to serve God’s people and the wider community through acts of charity and volunteer opportunities to further the mission of a particular ministry, agency, or organization. Frequent opportunities are available to effect the work of our Servant Ministry Partners and our journeys with Christ. Social Justice is our commitment to measures and laws as well as engagement of systemic and policy reforms that move persons in need from dependency to greater self-sufficiency; from privileges to rights; from lower to higher quality of life; and from shame to dignity. This continuum involves initiatives that move an individual from temporary to more permanent solutions; from one-time assistance to extended help; and changing our ministry focus from individual responsibility to that of a systemic change, often through policy-making. Outreach and social justice are not mutually exclusive. Both acts of charity and policy-making are necessary for followers of Jesus. For information, including how to serve, visit www.st-peters.org/outreachandsocialjustice, pick up a Servant Ministry through St. Peter’s booklet, or contact the Parish House Receptionist (704-332-7746) to be directed to the appropriate person. Guild of the Christ Child for households with infants Healing and Intercessory Prayer Ministry Home Communion to the sick and shut-in Lay Pastoral Visits to the sick and shut-in Community of Hope Servant Ministers Prayer Shawl Knitting Group Ministry Support Group for the Sick and Caregivers To serve through or learn more about support from these ministries, contact the Reverend Ollie V. Rencher (orencher@st-peters.org, 704-749-6140). Life at St. Peter’s includes an open invitation for all members, non-members, and visitors to practice giving with gratitude in the offering of a combination of their time, talent, and treasure to the glory of God, and in support of the mission, ministry, and vision of the parish. The practice of gratitude makes it possible for St. Peter’s to maintain and prosper in God’s work, within and beyond our doors. Throughout the year, all individuals and households are encouraged to engage in the ministry of giving alms (money) whenever an offering plate is passed, and to prayerfully offer a pledge to support St. Peter’s Annual Fund. Giving with gratitude provides for the worship, outreach, programs, clergy, staff, administration, and facilities of the parish in ways that further the business of God’s Church, and that cannot be imagined in the moment. On Sundays, September 17 and 24, and November 19, several Parish Leaders and The Rector will lead Parish Hall Forum discussions about the spirituality of giving, our relationships with money, and the cultural challenge of giving to the Church from places of scarcity versus abundance. Giving at St. Peter’s also includes the St. Peter’s Episcopal Church Endowment Fund, Inc., established in 1955 to provide a means for people to leave a legacy to the Parish through planned gifts during and after their lifetime. St. Peter’s Planned Giving ministry was established in 2002 to increase support of the Endowment by increasing the number of planned gifts offered to the Endowment. The Endowment provides generous resources to the Parish by funding outreach grants for Charlotte area service agencies from Endowment income and by helping the Parish to meet extraordinary needs. Those who pledge gifts to the Endowment are members of the 1834 Legacy Society, named for the year Episcopalians first organized for worship in Charlotte. To learn more about the ministry of giving at St. Peter’s, visit www.st-peters.org/give or contact Parish Administrator, Leigh Dixon (ldixon@st-peters.org, 704-749-6142). Save the Date The following are a few parish community events associated with the giving of time, talent, and treasure beyond and within our doors. Saturday, October 7 “Seeing the Face of God in Each Other,” anti-racism Seminar, 9:00 am–4:30 pm hosted for the Charlotte region by the Diocese of N.C. Saturday, October 14 St. Peter’s Habitat for Humanity House Build. Sunday, October 15 CROP Hunger Walk at Independence Park. Sunday, October 22 God’s Tapestry Potluck and Conversation. Sunday, October 29 “Becoming a Jesus People: Servant Ministry Opportunities through St. Peter’s,” Parish Hall Forum. Sunday, November 5 2018 Annual Fund Pledge Commitment Sunday to support Outreach, “Inreach,” and Operations. Wednesday, December 6 through March 28 Room in the Inn, a program of Urban Ministry Center, partners with St. Peter’s to offer weekly overnight housing of unhoused neighbors in our Parish Hall. Sunday, December 10 Children, youth, and families make Advent cards for parishioners and Christmas cards for the “White Beard Project” of Supportive Housing Communities. e believe that music has a unique capacity to heal brokenness, enliven hearts, and connect people with God and one another. Throughout history, it is described as a universal language. The gift of music is readily available at the corner of North Tryon and West Seventh streets in Center City Charlotte. We offer inspiring music during multiple worship services each week as well as performances by the young singers of The Choir School at St. Peter’s and seasonal offerings sponsored by Center City Concerts at St. Peter’s. Both are separate, nonprofit organizations based at St. Peter’s and governed by respective boards of directors. The St. Peter’s Choir leads worship weekly, making use of early music as well as music from the modern era, including music composed especially for St. Peter’s Church. The St. Peter’s Choir also provides music for special feast days, such as Advent Lessons and Carols, Christmas Eve, Ash Wednesday, Palm Sunday, Maundy Thursday, Good Friday, the Great Vigil of Easter, and Easter Day. The St. Peter’s Choir consists of approximately 40 volunteer choristers and four section leaders. Rehearsals are demanding and the repertoire is serious and challenging. Prospective choristers need a good command of music reading and interpretation. In the Summer of 2017, the St. Peter’s Choir made a first-ever pilgrimage to St. Albans Cathedral in the U.K. to serve for one week as the choir-in-residence at the Cathedral, a perfect example of the gift that these ministers are to life at St. Peter’s. St. Peter’s Evensong Choir provides an opportunity for highly skilled musicians to participate with a minimum of rehearsal time. To schedule an interview or discuss an audition for any of the choirs, contact Director of Music and Organist Elizabeth Lenti (elenti@st-peters.org, 704-749-6147). Center City Concerts at St. Peter’s will offer occasional performances between September and Spring 2018. Concerts are free and open to the public. Center City Concerts at St. Peter’s is a separate nonprofit funded by donations and other support. For more information, visit www.centercityconcerts.org and watch the parish news and notices for concert dates and times. The Choir School at St. Peter’s is an auditioned community choir with a mission to enrich young lives through excellent, rigorous music education and choral performance. Founded in 1993, The Choir School serves dozens of talented young people ages seven to 18 and includes 5 ensembles: Boys Town Choir, Girls Town Choir, Boys Tour Choir, Girls Tour Choir, and MasterSingers Choir for high school students. as educators, therapists, business and nonprofit professionals, scholars, and volunteer leaders. The choirs perform in concert at St. Peter’s and throughout Charlotte, as well as with partner arts organizations, including Opera Carolina and Charlotte Symphony Orchestra. They perform for audiences throughout the U.S. each summer, and the MasterSingers travel to England to perform every four years. To arrange an audition or for more information, contact The Choir School Managing Director, Kay Johnson (kjohnson@ st-peters.org, 704-7496146). The Choir School at St. Peter’s is a separate nonprofit funded by donations and other support. For more information, visit www.thechoirschool.org and watch the parish news and notices. Save the Date Sunday, September 10 Center City Concert: Music for Organ and Orchestra, with Nicolas Haigh, organist and conducted by William Osborne, 7:00 pm. Sunday, September 24 Choral Evensong begins, offered most second and fourth Sundays into Spring 2018, 5:00 pm. Friday, October 14 Choir School Cabaret Night, 7:30 pm. Sunday, December 3 Advent Lessons and Carols, 10:45 am. Friday–Saturday, December 8–9 Holiday Concerts of The Choir School, 7:30 pm. Sunday, December 24 Christmas Eve at St. Peters: 4:00 pm with Pageant; 7:00 pm and 10:30 pm, both preceded by a Choral Prelude. e believe that sharing intentional time with others who make up the body of Christ—through fellowship and fun and joyful celebration of the seasons of life—is important to a life in faith. Through weekly and seasonal fellowship offerings, we celebrate and strengthen our holy interconnections as people of God. When we laugh together or break bread together, each gathering reminds us how much we need each other. Through groups, guilds, and events of various sorts, we experience the opportunity to exchange stories, learn from each other and share time, which brings refreshment and restoration to those who come together. Fostering holy friendship supports our individual and collective journeys of faith. Save the Date Sundays August 13, September 10, October 8, November 12, December 10 Parish Community Potlucks. Offered to increase community among newcomers and members. Watch parish news and notices for more information. 12:15 pm, just after 10:45 am service. Sunday, August 20 St. Peter’s Parish Celebration: Rally Day and Ministry Fair. All-ages gathering between the Parish Hall and Community Room. 9:30–10:30 am. Friday–Sunday, September 15–17 Parish Retreat Weekend at Kanuga. Annual getaway for fellowship, rejuvenation, and recreation. Register online or call 704-332-7746. Saturday, October 14 Shrimp and Suds on the Parish House Rooftop Patio. This adults-only fundraiser to support the 2019 Youth Pilgrimage is for parishioners and guests. 6:30–9:30 pm. Sunday, October 22 God’s Tapestry Storytelling and Potluck Dinner. All ages gathering to become better acquainted through storytelling. 6:00 pm. Thursdays, September 7, October 5, November 2, December 7 Pub Theology – All adults are welcome to join a member of the clergy and others for fellowship and holy conversation on the first Thursday of the month, locations to be announced. 6:00–8:00 pm. Sunday, December 10 Festive Advent Parish Community Potluck. On the day of the 9:30 am Annual Meeting of the Parish, plan to join others at the 10:45 am liturgy for an 14 all-ages celebration of the season. Sunday Morning Fellowship Holy Chow Breakfast From Sundays during the program year, all ages join in the Community Room, second floor of the Parish House, 8:30–9:25 am, for one of the “best breakfasts in Charlotte.” The cost is $4 per person or a maximum of $15 per household. You can also volunteer to help once a month by contacting Tate Sterrett (tsterrett@horacktalley.com). Parish Lobby Hospitality Need a place to have a quiet conversation, read, or informally connect with others? Visit the Parish House lobby where you’ll find coffee and places to sit. Parents Connect Beginning in the Fall of 2017, a new fellowship opportunity for parents of children and youth will gather occasionally to foster community and offer encouragement. Sundays, 9:30–10:30 am, in the “St. Peter’s Café,” located on the entrance floor of the Parish House. For more information, contact the Reverend Jacob E. Pierce (jpierce@st-peters.org, 704-749-6150). Coffee Hour Gather in the Parish House Lobby following the Sunday 10:45 am service for coffee, conversation, and light refreshments. Groups and Guilds Connect with others through the groups and guilds at St. Peter’s. Young Adults Fellowship Parishioners (21+, single, married, partnered, parent, non-parent): learn and serve through seasonal fellowship and formation events. Contact Mary Gotschall (marygotschall@gmail.com). Senior Class Fellowship Parishioners (55+) who meet monthly for an informal lunch on the third Tuesday of every month at 11:30 am, location announced monthly, and twice a year for a party. Contact Hannah Craighill (704-3346276) or Barbara and Jay Partington (704-523-1831). St. Mary’s Guild Women’s group meets the first Monday morning of each month (excluding July and August), in a member’s home for fellowship, Bible study, and service projects benefitting the parish and community. For more information, contact Lynn Lakin (704-996-5838, lynn.lakin1@gmail.com). Prayer Shawl Knitting Group Meets every first and third Tuesday at St. Peter’s in the parlor from 10:00–11:30 am to create shawls for parishioners on various occasions in their lives. For more information, contact Jim Amburn (j_amburn@aol.com)or Linda Smith (lvsmithnc@gmail.com). Our Seal “You are Peter, and upon this rock I will build my church.” These words of Jesus, found in Matthew 16:16–19, appear on the official seal of St. Peter’s Episcopal Church in Latin: Tu es Petrus et super hanc petram aedificabo ecclesiam meam. At the center of the seal are two keys, symbolizing more of Jesus’ words: “I will give you the keys of the kingdom of heaven.” The year, 1834, signifies the year in which St. Peter’s was organized for worship before recognition as a parish church in the Diocese of North Carolina in 1844. It was the first Episcopal Church in Charlotte. 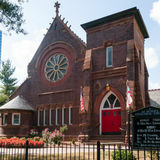 To learn more about the history of St. Peter’s Episcopal Church, visit our website, www.st-peters.org, or obtain a copy from the Parish House lobby. Volunteer Receptionists and Administrative Support Candace Armstrong, Bob Atkins, Tina Coelho, Sue Coonen, Alice Dresser, Diana Gibbs, Kitty Hughes, Pat Markel, Sue Martin, Hulene McLean, Wendy Merrill, Nancy Sarazen, Carole Whittington. Episcopal Diocese of North Carolina The Right Reverend Samuel Sewall Rodman III, Bishop Diocesan The Right Reverend Anne Hodges-Copple, Bishop Suffragan Visit www.dionc.org. Diocesan House in Raleigh. The Episcopal Church The Most Reverend Michael Bruce Curry, Presiding Bishop Visit www.episcopalchurch.org. Episcopal Church Center in New York City. Anglican Communion The Most Reverend and Right Honorable Justin Welby, Archbishop of Canterbury Visit anglicancommunion.org. Anglican Communion Office in London.